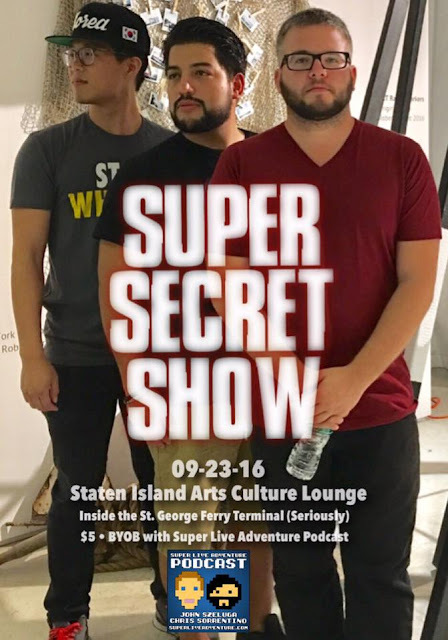 Featuring Impractical Jokers Executive Producer Marina Catala! This week we talk about the Berenstain Bears, Donald Trump, Gremlins 2, Star Trek, Star Wars, the Coen Brothers, ukuleles, Princess Bride, Canadian comedians, Impractical Jokers, and more! The guys talk about cats, bad costumes, cactus injuries, homemade booze, homemade ooze, baby names, accidental racism, Montreal, Pompeii, meatballs, school lunch, bad autographs, comic book movies, and more! The guys enjoy some cigars and Sorrentino screwdrivers while discussing Netflix's Stranger Things, community supported agriculture, flat tires, jug band life, family, the 2016 presidential election, and more! 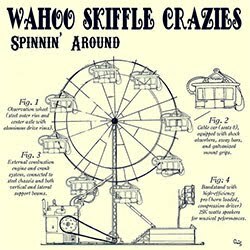 "Blues My Naught Sweetie" by the Wahoo Skiffle Crazies. 10 PM May 4th at Marie's Gourmet, 977 Victory Blvd., Staten Island, NY. 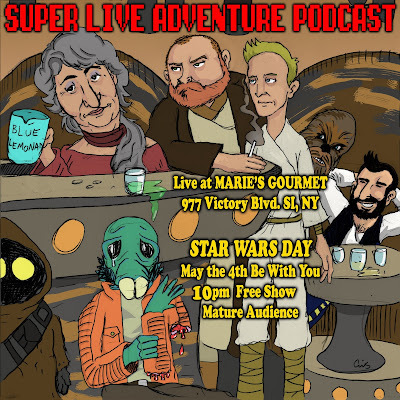 Celebrate Star Wars Night (May the 4th be with you) at Marie's Gourmet on Staten Island! It's also Taco Night and Date Night, so there's something for everyone (if you hate Star Wars and you don't have a date, you can just sit in the corner and fill up on tacos). 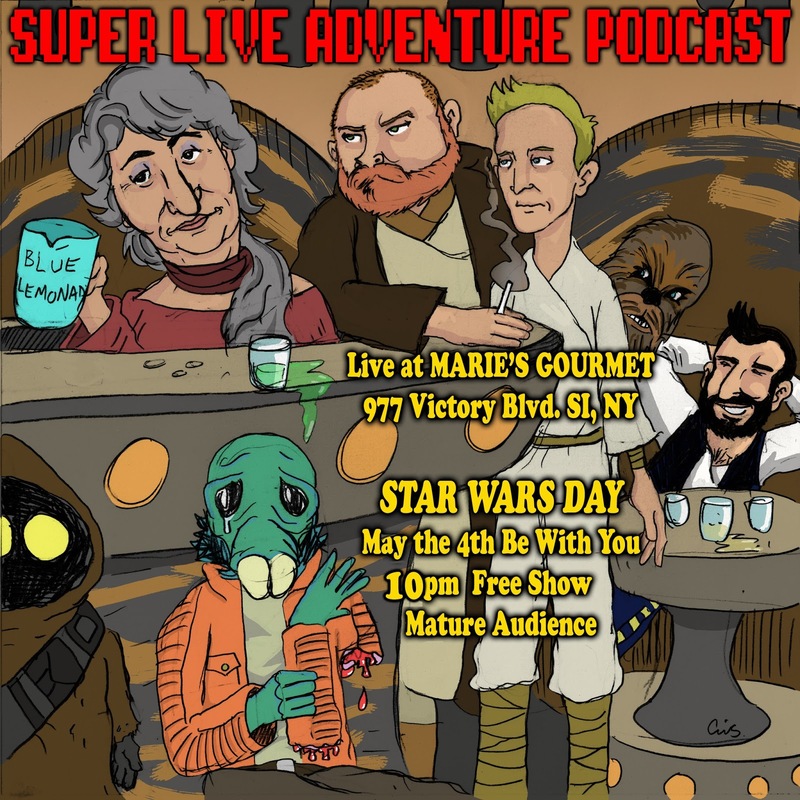 Come party with us and be a part of our live audience as we record a new episode of the Super Live Adventure Podcast with our very special guest, Jenny Miller of Les Vinyl! Our buddy Rob Yuzuk (past guest and member of the Wahoo Skiffle Crazies) will be making some Star Wars themed cocktails behind the bar. If you're not a big Star Wars fan, don't worry. Jenny Miller isn't a big Star Wars geek either, so we'll definitely be tackling other subjects, as we always do. Ezra Donellan returns! 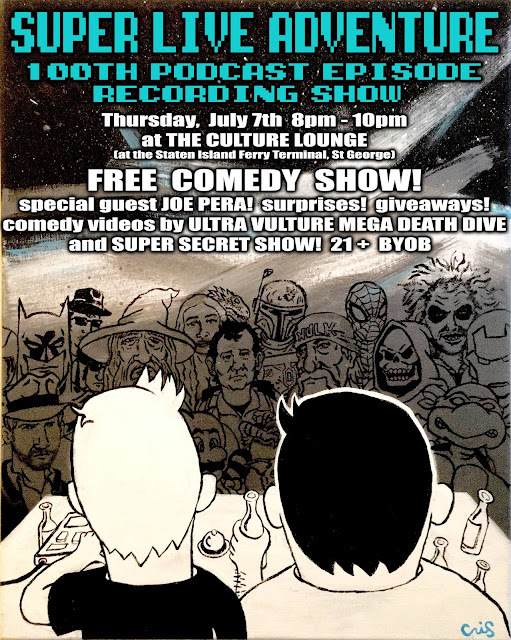 Listen as the guys talk about past episodes, water filters, California, Burn Notice, Breaking Bad, elephants, board games, bad movies, $100,000 Pyramid, talk show hosts, ethnicity, lawn gnomes, Fraggle Rock, The Jetsons, Superman, I Love Lucy, comic books, John's latest sleep study, Bruce Willis' singing career, Bryan's weird coworker, and (finally) Bryan's Kid Rock story. Spoiler Alert: This one doesn't end well.